Wine without food is unthinkable, especially in Napa. After all, the Napa Valley is not only home to 400 some wineries, many of which can be visited, but has hundreds of restaurants that are open to all. Some are glorious Michelin three-stars (Meadowood Resort), while others are glorified drive-ins (Gott’s Roadside) – both of these places are favorites of mine. But there are three places I seem to end up over and over again- mostly I guess because it’s where the locals go. 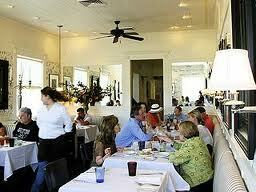 Cindy’s Backstreet: Whenever I meet with a winemaker, Cindy’s is inevitably our agreed-upon lunch spot. The food is solid, the staff is friendly- and the bar is a great place to people-watch. Cook Restaurant: I’ve seen many an illustrious winemaker and vintner sitting down to a simple dinner of (excellent) roast chicken at Cook’s. (Famous wine names include: Bart Araujo, Beth Novak Milliken and Bob Foley). The wine list is fairly priced, but you can also BYOB for a reasonable corkage fee. Rutherford Grill: The burgers (and the winemakers who eat them) are the draw at this unpretentious spot in Rutherford, a town that’s not really so much a town as a place in the road (and the address of famous wineries like Caymus and St. Supery).